Improved macroeconomic outlook. This is characterised by a recovery that is now strong and broad-based. 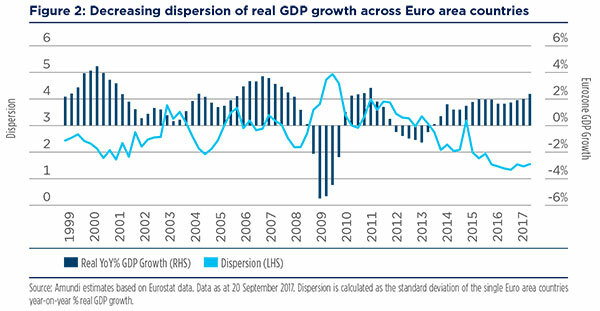 Euro area GDP is now above the 2007 level, meaning a recovery from the losses seen after the financial crisis. The recovery is now broad based across the Eurozone. Stronger efforts from politicians to push reforms. Progress in implementing reforms at both the EU and at single country levels is crucial for the adjustment of macroeconomic imbalances and – on a longer-term perspective – supports a rise in the potential growth rate of the economy. 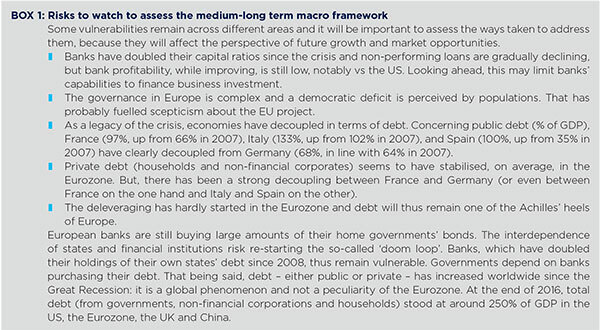 Lower geopolitical risk in the Eurozone. This is due to improved political stability, and reduced uncertainty about the whole EU architecture. 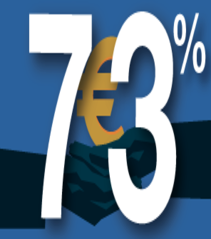 European citizens have become more optimistic about the EU and the Euro as a single currency. A strong leaders’ commitment to strengthen the European project will continue to be crucial to attract domestic and foreign investors. Improved earnings outlook. Based on the persistence of accommodative monetary policies, and helped by the robust domestic demand, companies are enjoying a more positive business environment which is translating into solid profit growth. Attractive valuations and market conditions. We believe that all these dynamics will support a continuation of growth which could benefit European assets, and equities in particular. Here, attractive valuations (relative to other markets) and a solid M&A outlook are positive drivers which should support further market appreciation in the coming months. Overall, we think that the concept of a European renaissance implies interesting opportunities in European equity markets for investors with a selective and risk aware mind-set. In the second part of this paper, we present ways to seize these opportunities while maintaining a strong focus on risk. In 2017, Eurozone GDP has recorded exceptional growth, and business surveys point to the continuation of this trend over the next quarters. The recovery now appears to be robust, broad-based among sectors, and synchronised across countries as shown by the decline in the dispersion of real GDP growth rates (Figure 2). This growth has mainly been driven by domestic demand, but it has also benefited from the strength of the global economic cycle and the subsequent rebound in world trade. 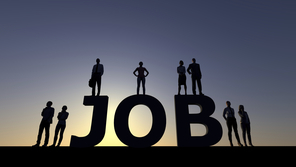 Tangible employment gains have underpinned the robust internal demand. In the Eurozone, over six million new jobs have been created since 2013. In the same period, the unemployment rate has dropped to 9.2%, from a peak of above 12%, with improvements also in the peripheral countries mostly affected by the crisis. The youth unemployment rate fell from almost 24% to around 19%. 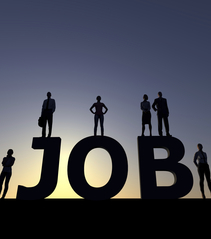 However, this is still about 4 percentage points higher than at the beginning of the crisis in 2007, leaving room for further employment gains in the coming months. The robust recovery in the Euro area is also helping to ease major macroeconomic imbalances which arose before and during the crisis. Fiscal deficits have improved noticeably thanks to the reduction in interest payments and – in many countries – as a result of the implementation of fiscal consolidation efforts. These two forces helped the Eurozone debt/GDP ratio to stabilise at around 90% of GDP, even if differences across countries persist. In our view, an acceleration of growth could support the continuation of this positive trend and further improve the sustainability of debt/GDP ratio going forward. The current account surplus is close to an all-time high at 3% of GDP in contrast to the UK and the US, both of which have deficits to finance. Large external deficits have declined in many countries of the periphery, or even turned into surpluses. More importantly, unsustainable external imbalances in peripheral economies have disappeared thanks to the convergence in competitiveness. The Eurozone continues to benefit from highly accommodative monetary conditions. Indeed, thanks to the ECB commitment in 2012 to do “whatever it takes” to save the Eurozone, and to the subsequent measures (including QE1, see Box 1), sovereign bond yields (and spreads) have fallen and bank interest rates charged to small and medium enterprises have re-converged, creating a positive backdrop for further economic expansion. As a result, there has been a general upturn in bank credit to the private sector which bodes well for the sustainability of the recovery. In this context, the ECB tapering has to be closely monitored: we believe it will be gradual and well managed but could create some resurgence in market volatility from the current low levels. Inflation is low and expected to remain subdued by historical standards. Wage inflation has started to materialise, but should remain moderate in the current environment. The low inflation environment should provide the ECB with scope to remove monetary accommodation at a very gradual pace, keeping financial conditions still relatively benign for corporations. Against this backdrop, the ongoing recovery is expected to continue. In fact, the Eurozone is the only area that has experienced a double dip since the Great Financial Crisis and consequently it is now at mid-cycle. The catch-up process that is taking place is therefore expected to continue and to result in GDP growth above potential in the years to come. Despite this positive cyclical outlook, the Eurozone still faces some structural challenges, such as high public and private debt levels, weak productivity growth, and a shortage of long-term investment. It will be important, in the coming months, to assess the evolution in these three areas together with the improvement in the field of structural reforms, as they will shape the medium-long term macro framework for Europe driving future market directions. Typical structural reforms fall into the areas of labour markets, product markets and the financial sector, as well as taxation and public sector reforms. Structural reforms are an important pillar for the future outlook of Europe and have already played a relevant role in strengthening the euro area. Structural reforms in many areas (labour market and service sectors) have helped to improve competitiveness, especially in peripheral countries which have seen a strong improvement in the ease of doing business based on World Bank data2. In our view, these reforms must and will continue to be put in place. On the financial side, we believe it is necessary to complete the banking union in order to avoid a new systemic crisis in the future and adopt new prudential rules, including: a permanent common backstop for the Single Resolution Fund and a common European Deposit Insurance Scheme. The ultimate objective would be to limit potential contagion between banking and sovereign risks and prevent deposit flight in countries in which banking sectors face a crisis of confidence. While we recognise that banking union is still a very long way off, we believe that the good news is that banking union is not a prerequisite for further progress on the integration of capital markets in the European Union – the Capital Markets Union (CMU), that is key to improve access to funding for European companies and therefore unlock additional growth opportunities. Achieving the CMU is, in fact, one of the most urgent goals at the union level to improve private-sector risk-sharing and reduce market fragmentation. Stronger capital markets are also needed to strengthen investment. Indeed, while the economic recovery is gaining momentum, the investment rate is still below pre-crisis levels. Substantial progress has been made since 2015 and further progress should be achievable, as this is a key priority for the European Commission, and there is a consensus that a full CMU is necessary to promote job creation, growth and investments in Europe. The objectives are clear: to facilitate access to markets by SMEs and to lessen their dependence on the banking sector, to expand equity financing, and to facilitate business access to financial markets and cross-border investments. Finally, in addition to these common goals, each European country is engaging in specific reforms regarding multiple areas, such as labour and product markets, as well as ad hoc reforms to tackle the non-performing loans issues. The latest of these are particularly relevant, as the decrease in Non- Performing Loans (NPLs) can also lead to a rise in loan supply and be an additional boost for the economic recovery. Looking into the future, we believe that all these reforms can further support the economic recovery. In fact, structural reforms tend to deliver most of their induced economic gains over the medium to long-term. So, what we have seen in terms of economic impact is only a fraction of future possible gains in terms of future GDP growth. On the political side, the outlook has clearly improved. The election of Emmanuel Macron as president of France is probably a game changer for Europe in general and for the Eurozone in particular. Political risks have diminished, at least in the short term and our perception has not changed radically, nor has the result of German election or the situation in Catalonia. We believe that the Catalonia crisis will not carry immediate systemic risk to the Eurozone, but has to be closely monitored, as any advance towards independence would have major spillover implications for countries that are facing similar movements. We expect France and Germany to lead the reforms in the Eurozone and progress in terms of financial architecture. Macron and Merkel share the view that the status quo is not an option with regard to the Eurozone (which is an incomplete monetary union that needs to be strengthened). They certainly appear to share the view that a strong and determined union is the best way to promote the EU’s values and interests. While probably not completely aligned regarding the specific measures to be taken, they appear strongly committed to deepening European integration, both from a financial and political standpoint. There is an “implicit deal” between France and Germany: if the French government succeeds in implementing structural reforms (starting with the job market) and respects fiscal rules (public deficit below 3% of GDP), Germany would be ready to make some concessions—in particular concerning the joint budget, parliament and finance minister for the Eurozone that Macron aims to create. Macron and Merkel pledged to draw up a “common road map” for Europe with a change in treaties if required. At this stage, however, that is clearly not the priority. There is much to be done on other issues, on both sides, if only in terms of policy coordination. However, it shows that both Macron and Merkel appear to want to leave the door open to some institutional reforms in the years to come. Political and financial integration is viewed as a medium-to long-term process on both sides. We would not expect a “quantum leap” in the short term. Rather, we would expect the French and German governments to launch joint initiatives, reinforcing the EU and the Eurozone step by step. Mr Macron’s recent proposals are received with varying levels of enthusiasm in Berlin. Not surprisingly, many Germans are resistant to the idea of a European budget because they see in that a disguised plan to move towards a federalist model of debt mutualisation. This is undoubtedly a red line for the next coalition government in Germany. The prospect of further fiscal integration remains a long way off. Governments will probably focus on issues that will strengthen the cohesion and resilience of the Eurozone, without putting in place mechanisms that could negatively affect taxpayers in the event of a crisis. all these issues, a common vision can emerge, followed by actions that will increase efficiency and reduce costs. Highly symbolic for Europeans, the progress made in these areas would strengthen the cohesion of Europe. And that is a common objective before the 2019 European elections. 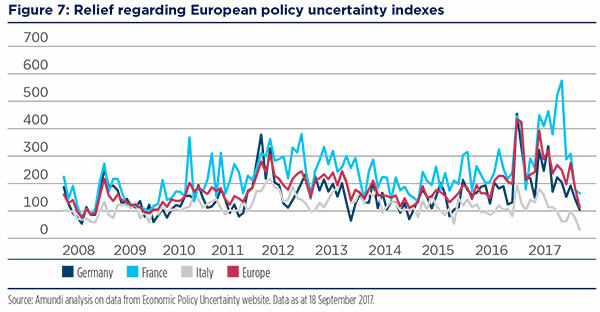 Overall, we believe that in the wake of the election of Macron and the re-election of Merkel, there is a new political landscape that will contribute to improved sentiment regarding European risk assets, even though come 2018, elections in Italy could cause a re-emergence of volatility and the evolution of the Brexit negotiations will also be an important factor to watch. The improved business confidence highlighted by the recent European PMI surveys3 (with the Eurozone PMI reading in September being the highest since April 2011) and the sustained European recovery have finally started to pass through to corporate earnings growth, the key catalyst that the market has been waiting for. Revenue has received a boost from solid domestic consumption and from a pick-up in capital expenditures, which have only started to recover after a period of prolonged weakness. Corporate revenue has increased as well thanks to broader and synchronised global growth: for example, more than a quarter of European revenue is directed to Emerging Markets (EMs), so stronger demand from EMs has benefitted European corporates. In addition, during the financial crisis, European corporates were particularly active in terms of cost reduction, and reducing financial leverage quite aggressively. These steps were important, as companies made significant efficiency gains, and this has ultimately placed them in a very strong position to benefit from the current supportive economic backdrop. Yet, the appreciation of the Euro has grabbed investors’ attention in recent months, as it could be a drag on earnings growth forecasts. It is important to note that the recent currency strength has largely been a result of the improved fundamental picture, so in our opinion it should not be seen as overly detrimental. 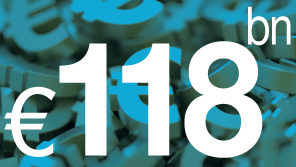 Our view remains, that while the shorter-term volatility in the currency may impact certain names and sectors (such as the exporters), we see the underlying economic improvements outweighing any currency headwind. And therefore, even including the Euro effect, we forecast EPS growth to June 2018 of 11.3% for Europe (the highest level globally) compared to 9.8% at a global level. Going forward, we believe it is important to carefully assess investment opportunities with a selective approach, to be able to identify companies that can continue to deliver attractive earnings growth. Companies with the higher operational leverage4 are, for instance, particularly attractive given these more macro-driven dynamics. At a sector level, cyclicals, such as auto, construction and consumer durables, typically show the highest levels of operational leverage. Selection is key also to assess the potential currency impacts in the shorter-term both on the cost and revenue base of a given company, in order to mitigate risk due to excessive currency appreciation. From a sector perspective, the financial sector, which represents a significant share of European equity indexes (around 21% of the Stoxx Europe 600), could be a potential beneficiary. Firstly, the sector is highly sensitive to the underlying economy, and therefore should benefit from improved economic sentiment driving lending growth. Another key support for profitability in the sector is a possible rise in interest rates, and, more importantly, the steepness of the yield curve. We might be entering a period of less accommodative Central Banks policy, whereby the ECB is getting ready to withdraw some of the stimulus in a measured and controlled way. Against this backdrop, we see the potential for a steeper yield curve which would be helpful for profitability – especially amongst the banking names. However, we are aware that the financial sector globally, and especially within the Eurozone, is impacted heavily by the more stringent regulatory measures implemented following the financial crisis. Therefore we believe that investors should be selective and focus on companies with adequate capital reserves on the balance sheet, and which are operating in compelling underlying markets. 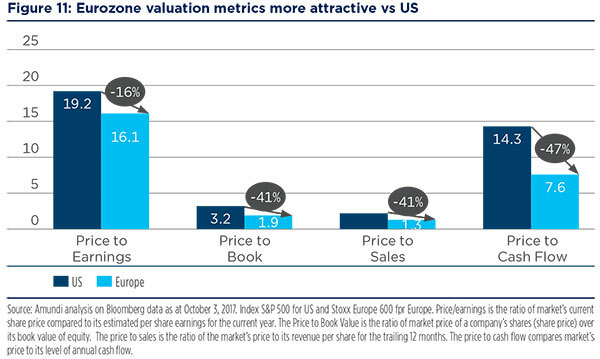 Looking at valuations, Europe does not appear particularly cheap in absolute terms. However, relative to other asset classes, or regions, Europe looks quite compelling – especially versus US peers. Ultimately, to see further upside, we need a continuation of EPS growth, and we believe that the current fundamentals should allow this to materialise. 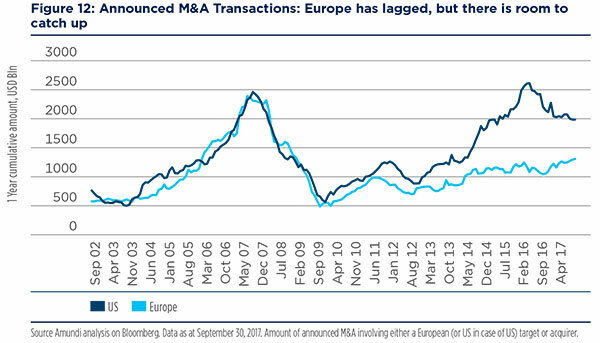 Another potential driver for a move higher would be a resurgence of M&A activity and corporate buy-backs within the region, especially now that growth for Europe looks more robust and political uncertainty has declined. Currently, we are seeing companies with strong balance sheets, high cash levels which, coupled with the low interest rate environment we are experiencing, should lead to fertile ground for an uptick in M&A and buyback activity. In this context. M&A activity is expected to pick up in 2018, with positive impact on value creation. As corporations focus on core business activities and carve out non-core but profitable assets, foreign (and domestic) buyers will have a larger pool of attractive acquisition targets in Europe. European equities are generally pro-cyclical and exposed to global growth. The recent improvements in the macroeconomic backdrop should be a natural tailwind for the asset class. As we previously highlighted, some sectors and stocks may be more exposed to this positive economic backdrop more than others. Therefore, we believe that a focus on stock selection will also be crucial to identifying structural winners that could have significant upside potential (i.e., quality companies with strategic competitive advantage, sustainable growth in profitability, and clear upside in valuation). We identify three investment themes for playing European growth. In an environment of improving economic fundamentals, potentially higher inflation and growth, rising interest rates, and growing earnings, value areas of the market could be favoured. In particular, rising bond yields have historically been associated with outperformance of the value stocks (which are priced at a discount) vs growth stocks which are valued on future earnings (that could suffer when future earnings are discounted at higher interest rates). Combining value with earnings growth, we believe, could be the sweet spot over the coming months. Cyclical sectors, in particular, could benefit in this phase being more economically sensitive, but as cyclicals have already outperformed over the last year, we think that a strong focus on companies that have the ability to continue to deliver solid earnings growth is needed. European markets offer among the highest dividend yields globally. In an era of low bond yields, investors may wish to exploit yield opportunities across the board to meet their income objectives, and European equities in our view are an interesting hunting ground for income opportunities. The drivers behind the Renaissance of Europe, as previously mentioned, have placed companies in much stronger financial health and this also translates into higher dividend yields in the region. 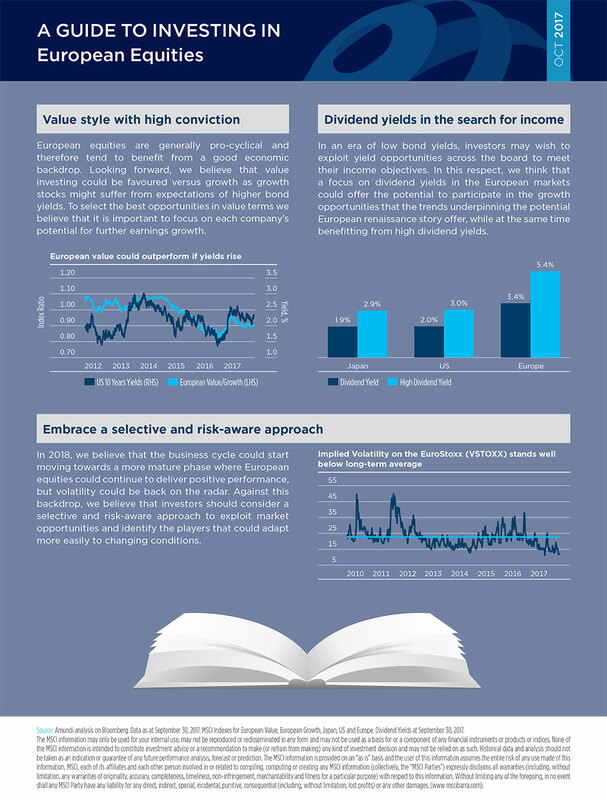 To best exploit income opportunities, however, we believe it is important to focus not only on current dividend yields, but also on each company potential to further deliver dividend growth. The positive backdrop that we have analysed previously will, in our view, drive a positive phase for European equities. However, in 2018, we believe that the business cycle will start to move towards a more mature phase where equities could continue to deliver positive performance, but volatility could be back on the radar. In fact, while we continue to remain optimistic regarding the outlook for risk-assets in Europe, we are aware of the potential for short-term bouts of volatility, from the current historical lows and therefore believe that a risk-aware approach is recommended. In our view, the greatest potential for volatility at this point is the high level of investor expectations in terms of both economic growth, and earnings delivery. Other catalysts for volatility would be a further rapid appreciation of the Euro (not our base case), or a more aggressive than expected tapering programme from the ECB. Against this backdrop, a rotation among sectors and stock selection could become more relevant to exploit market opportunities. 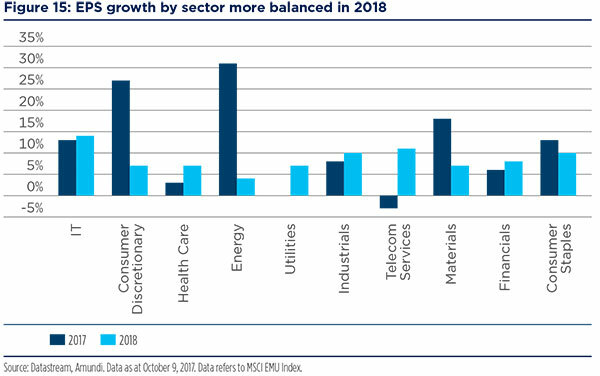 In fact, in 2017 earnings growth has been mainly driven by a few sectors with consumer discretionary, energy and materials delivering together 60% of the MSCI EMU earnings growth vs a 27% combined weight in the index. Moving towards 2018 we foresee a more balanced contribution among sectors and therefore stock selection within the sectors could become more relevant to exploit the most compelling opportunities in terms of earnings growth. The focus on stock selection will also be crucial in identifying the players that could more easily adapt to changing conditions. In our view, understanding each company business model, the quality of the balance sheet and the management ability to translate the current positive economic environment into future success will be key to identify future winners and avoid companies that could be penalized in case of a resurgence in market volatility. The Renaissance of Europe is firmly in place, and is a clear tailwind for European equity markets. The economic recovery is more broad-based than before, with structural reforms underway helping to integrate more aligned policy decisions. The lower level of geopolitical risk that followed the elections in France and Germany is supporting an improvement in risk sentiment. Equity markets are also somewhat underpinned by improving corporate fundamentals, namely earnings growth and some attractive valuations when compared to other asset classes and geographies. Finally, for investors with an income objective, European equities offer a very compelling yield compared to other markets, which may act as an additional source of interest for the asset class. 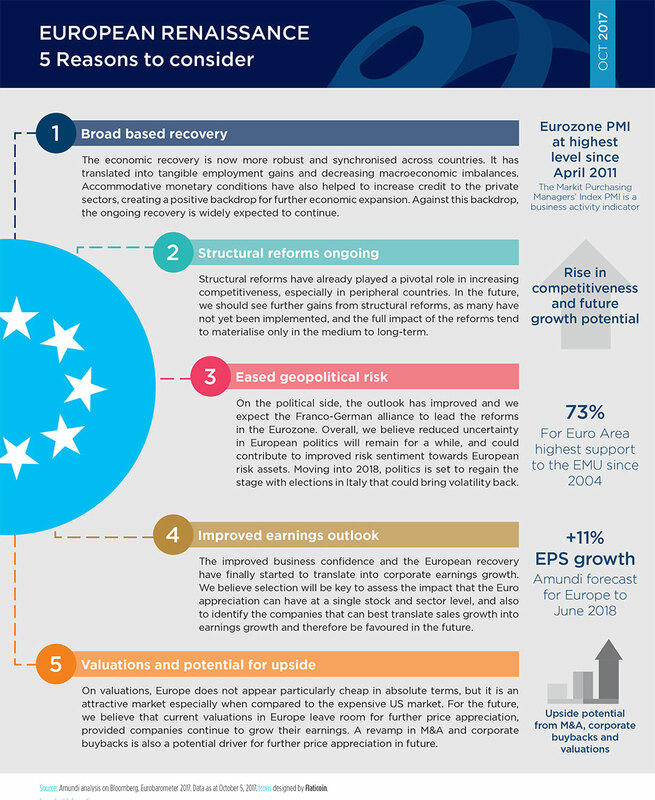 These factors clearly pave the way for a brighter outlook for European equities. Recognising that volatility remains very suppressed, and the potential for an uptick, we believe that the best way to exploit the Renaissance is to focus on the individual companies which are best placed to benefit from the improving trends. 1-Quantitative easing (QE) is a type of monetary policy used by central banks to stimulate the economy by buying financial assets from commercial banks and other financial institutions. 4-Operational leverage is a multiplier factor that indicates what proportion of revenue growth would translate into operating income (i.e., earnings before interest and taxes). The portfolio investment outflows from the Eurozone accounted for € 118 bn in April alone. This is the most important monthly figure for more than 15 years.